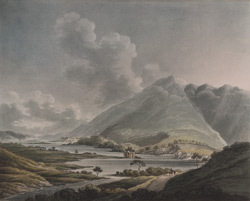 View of Loch Awe in the Highlands of western Scotland by Alexander Campbell (1764 – 1824). At 26 miles in length Loch Awe is the longest inland loch in Scotland. It is 1 mile wide for most of its length and the waters drop to depths of over 300 feet. It is dominated by Ben Cruachan which stand at a height of 1101 metres. Alexander Campbell, a Scottish musician, writer and artist, travelled widely around Scotland in the 1790s collecting specimens of minstrelsy and painting the beautiful landscape.